Dramatic floral pieces are near and dear to my heart. I've been painting my whole life, but the works of the late and GREAT Georgia O'Keeffe really sealed the deal on my passion for art and the pursuit of a creative career. Georgia O'Keeffe's floral masterpieces are a huge source of inspiration. On the left is her "Jimson Weed" piece. On the right is a copy I attempted junior year of high school circa 2002. I've been working on a range of different subject matter lately, but I will ALWAYS come back to the intense and emphasized florals. These pieces can be striking and powerful; they evoke a range of emotions and are always teaching me something new. I've also found that they make a deep connection with viewers, and nothing could make me more happy and proud than when my work has a true affect on someone. That's what art is all about. For the past few years, I have been creating custom floral pieces as wedding gifts for my closest friends. It's how I have been able to share my love and happiness for them as well as my gratitude for being included in a truly special and important day. Whether it be a portrait of one of their chosen wedding flowers, or a piece I feel bests represents their love, these gifts have been just as special to me as I hope they are to my loved ones. "The Gardner Peonies" 30x40 oil on canvas - a wedding gift for two of my dearest friends and greatest supporters. 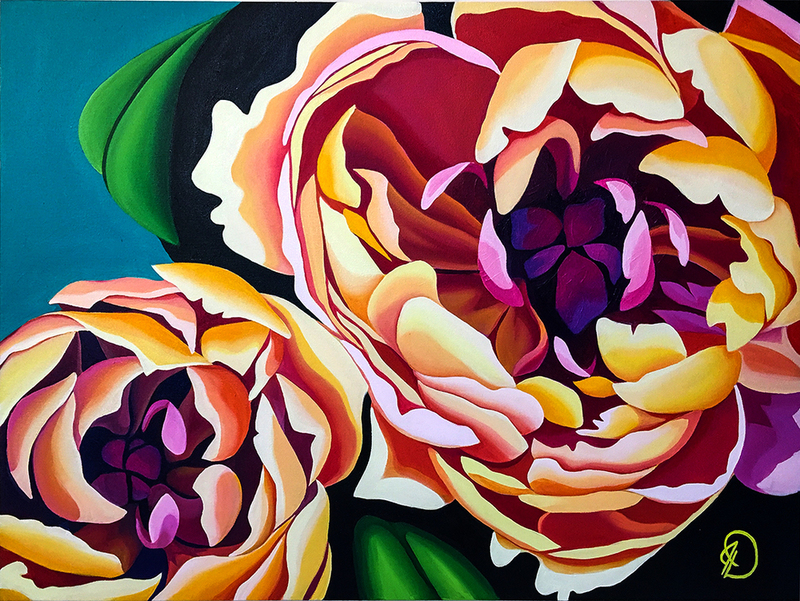 "The McDonald Peony" 24x24 oil on canvas - Two of my best friends got married in a peony garden. Its was breathtaking and this is a portrait of one of the blooms growing on the day they got married.